LIKE NEW!! 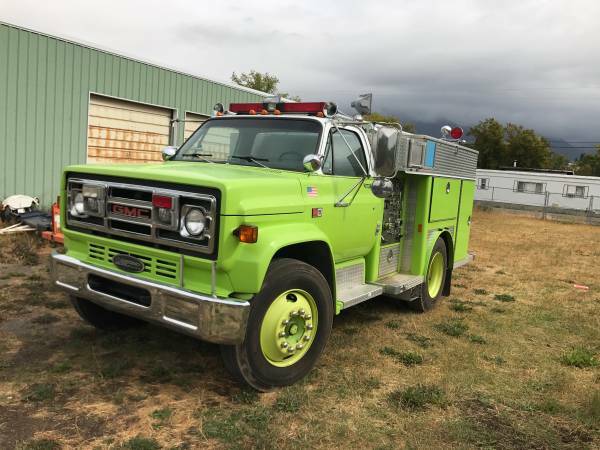 Only 11,833 Miles * 1984 GMC C7000 Fire Truck, Brush Truck, Water Truck, Fire Fighting Truck * Emergency One Bed * 300 Gallon Water Tank * Hale 250 GPM Pump * Left 2 1/2" Discharge * Left 3" Suction Input * 4 Rear 2 1/2" Discharge * High Output Adjustable Height Work Lights * Air Brakes * Allison 4 Speed Automatic Transmission * 8.2L GM Diesel Engine * Chelsea PTO * Hot Shot Generator 4- 120V Outlets and 1 240V Outlet * Whelen Sirens * Onboard 10 Amp Automatic Battery Charger * Onboard Air * 50 Gallon Fuel Tank * Lighted Cabinets SN: 1GDK7D1GXEV534913 Odometer Reads: 11,883 Pump Hour Meter Reads: 225 EXTERIOR Paint: Good Body: Good Bumpers: Good Glass: Good Tires: Michelin X 10R22.5 RF: 20/32" LF: 21/32" RR 23/32" LR: 23/32" Wheels: Steel. Good condition Lights and Sirens: Fully equipped with lights, sirens and horns Brakes: Air. Good. Operation normal INTERIOR Seats: Good Dash: Good. All gauges operate normally Floor: Good Heat: Good. Operation normal DRIVE Engine Type: 8.2L GM Diesel Engine Condition: Good. Good cold start, runs good. Good compression. Cylinder balance normal. No blowby. No smoke Trans Type: 4 Speed Allison Automatic Trans Condition: Good. Operation normal Final Drives: Good. Smooth and quiet Suspension: Spring Power Steering: Good. Steers easily Steering: Good. Tight Top Speed: 55 MPH + Fluid Levels: Good DIMENSIONS GVW: 24,500 LB W: 98" x H: 8’ 6" x L: 19’ 6" Wheelbase: 124" Cab to Axle: 61" Estimated Weight: 18,000 LB SUMMARY Perfect rig!! Like new condition! Ready to use.